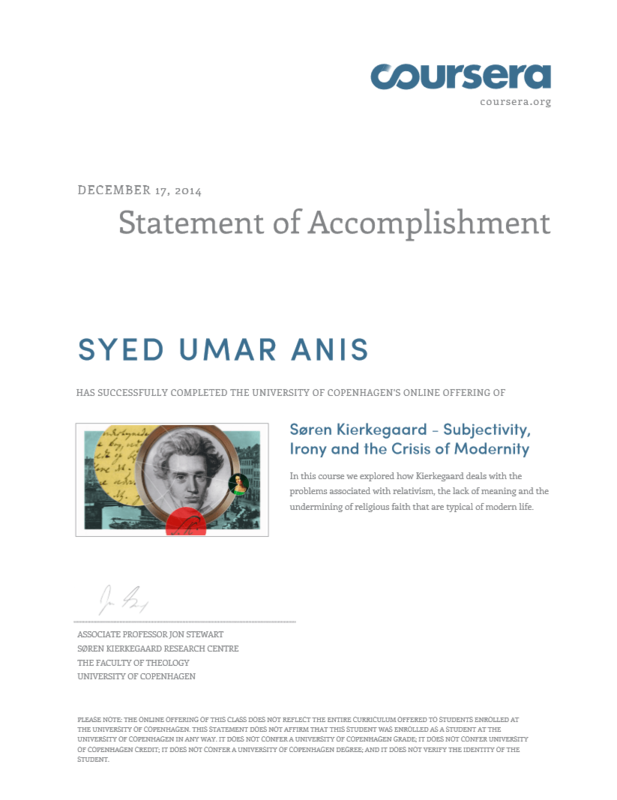 Completed ‘Søren Kierkegaard – Subjectivity, Irony and the Crisis of Modernity‘ course taught by Associate Professor Jon Stewart from University of Copenhagen. The course is offered through Coursera platform and ran for 8 weeks from 6st October 2014 through 1st December 2014. Course consisted of weekly reading assignments from the works of Kierkegaard, followed by video lectures where Professor Jon provided the background of the text and explained the key points. Video lectures are shot at various locations in Copenhagen which are associated with the life of Kierkegaard. The course concluded with an assignment to write a shot essay on a given topic related to Kierkegaard’s ideas. My essay was on ‘What did Kierkegaard learn from his study of Socrates? Why is this connection between Socrates and Kierkegaard still relevant in the world today?’.